Welcome to the all new Roof Raisers website Dallas/Fort Worth's premier party band, wedding reception band and variety band, specializing in Pop, Rock, Jazz, Swing, Country, 60's and R&B. Since 1986 The Roof Raisers have been entertaining audiences-- playing over 1200 special events including corporate events, weddings, fund raisers, birthday parties, anniversaries, and more. The band is fun, flexible and easy to work with and the lineup can be customized from as little as a 5-piece combo group all the way up to a 9- and 10-piece full band. HEY COUNTRY FANS... THE ROOF RAISERS BAND IS ALSO A FABULOUS COUNTRY BAND! The Roof Raisers band is a professional party band that excels in nearly every style and genre of music, and guarantees to make your special event a smashing success! An absolutely fabulous variety band! 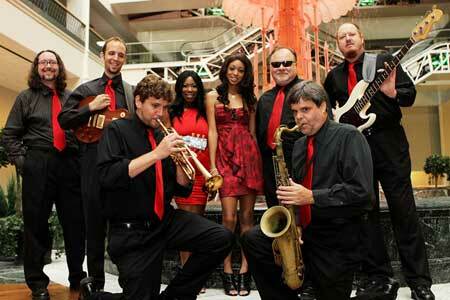 Their musical specialties are pop, rock, country, 60s, 70s/disco, jazz, blues and swing/big band. 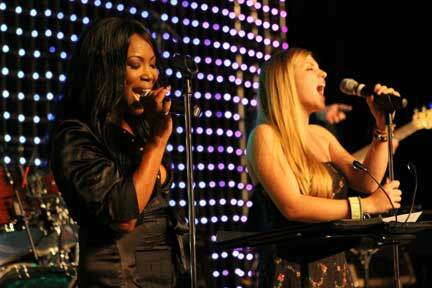 The Roof Raisers will lend excitement, flair, and class to your special occasion. Comprised of distinguished members of Dallas' music community, we can provide virtually any type of musical experience or atmosphere you desire. From the beloved Big Band songs of the 30s and 40s, to Motown classics of the 50s and 60s, to the Disco era of the 70s, and finally to the latest dance music of the 80s and 90s - we do it all, and do it well. 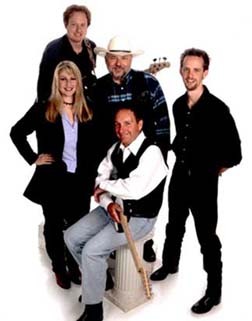 The Roof Raisers also play numerous Country/Western favorites ranging from Patsy Cline and Bob Wills to Garth Brooks, Tim McGraw, Shania Twain and The Dixie Chicks. Since a large number of the Roof Raisers' affairs are wedding receptions and conventions, and with their musical diversity, people of all ages and tastes will be thoroughly entertained both on and off the dance floor. They can dress in black tie for formal affairs, "hip/casual" for a pop/rock event, or don boots, bolo ties and blue jeans for the C&W celebrations. 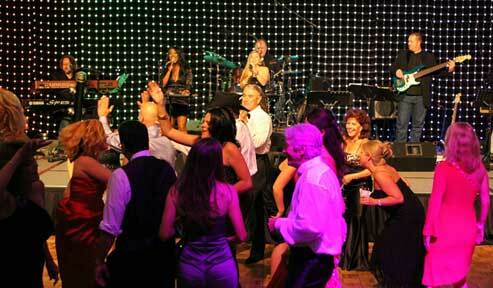 It's your party, and we'll do whatever it takes to set the right mood for you and your guests! If you want the bigger sound, hire THE ROOF RAISERS as an 8 to 10 piece band and get the excitement of the added horns and percussion. "We were very please with the Roof Raiers Band! They really kept the party going, and the sound level was perfect!" "Gene, Just wanted to send you a quick thank you for the fabulous performance last night! You guys did a fantastic job and made the night that much more special! We hope you enjoyed playing! Thanks again!" "My wife & I have recieved dozens of compliments regarding the fabulous band. We continue to hear that the band was magnificent! "Mark and I wanted to let you know what an amazing job you did at our reception. Everyone has told us it was the best time they have had at a wedding reception! "They were great sports! ...and they sounded great!" "They played a great variety of songs that gave everyone a chance to dance throughout the evening. Several friends asked for the name of the group! We'd use them again for sure." "I had a number of comments how good they were. They were wonderful - I would highly recommend them." "Excellent music - just what we wanted. Gene and the group were nice to deal with. Thanks to them and to you for your help." "Thanks so much for making the reception so wonderful.... We got so many compliments on the band - everyone really loved you! One of the things I noticed was how great the music was, but it wasn't so loud you couldn't carry on a conversation. I will definitely recommend you to any friends who might be planning a wedding or another event." "This letter is to commend Gene Glover and The Roof Raisers on the great job they have done for American Airlines’ Length-of-Service Dinner/Dance. They have performed at this function twice each year for the last 8 years…The group is dependable and their performance is outstanding..."
"…the music was absolutely wonderful, and you and the other band members went out of your way to make us feel special…"
"…The Roof Raisers is a class act of musicians. We would be willing to recommend you to others and to provide you with a personal reference…Thanks again for a fun evening!" "…Many, many thanks for an absolutely spectacular performance. Hands down, The Roof Raisers band is the band for wedding receptions or for any other gala occasion…"
"What a great, great job you did for the reception! It was a real celebration, and it couldn’t have been that much fun without you guys!…"
"Bravo to The Roof Raisers! The music was outstanding…your timing for each of the selections was superb…There can be no higher compliment than having a full dance floor each time you play…"
"You as individuals and as a band are GREAT!!! Thank you very much for providing excellent music and entertainment for our Christmas party….Your mix of music and your wide variety of types of music provided for a non-stop evening of music and fun for everyone at our party….all ages at our party could enjoy your music because of the variety – from old to new!" "…we enjoyed your music – it added the absolute perfect touch to the evening, thanks to your talents and creativity helping to make it so." "The Roof Raisers were great! Not only did they liven up about 100 professionally straight, somber lawyers and their spouses, but they did it in great style…"
"Thanks for a great party! You guys outdid yourselves. We had a wonderful time, and thanks for all your hard work!" "WOW !!!! You guys were awesome !! We were really impressed and your band is great !! Very, very enjoyable !!! " "It was outstanding !!! " "You guys were GREAT !! You MADE the party." "I just wanted to let you know what a great job you did at the party last night. You were amazing!!! Your band really made the night. Thanks!" ...several people stopped me to say that was the BEST holiday party we have had. This one was awesome. Everyone seemed to have a great time. We had great raffles, great food, and the band – well, the band was dynamite!" "Anyone planning a special event should consider hiring The Roof Raisers!"